Anyone who lives or works in the Brooklyn community has 48 hours, beginning Tuesday, to prove immunity, be vaccinated or risk a $1,000 fine. The city has declared a public health emergency, mandating measles vaccinations for Brooklyn residents who live in the epicenter of the current outbreak that has infected almost 300 people. The order, issued on Tuesday by city Health Commissioner Dr. Oxiris Barbot, includes four ZIP codes in Williamsburg. The outbreak has been focused in the neighborhood’s Orthodox Jewish community. Officials said they are concerned unvaccinated people will transmit the disease as they travel and gather with family during the upcoming Passover holiday. A small but vocal group of people opposed to vaccinations is helping fuel the outbreak, including parents who hold “measles parties” for their young children in a misguided effort to create a more natural immunity, officials said. Residents who live in the 11205, 11206, 11221 and 11249 ZIP codes had 48 hours starting Tuesday to get vaccinated. People who refuse to get vaccinated could face a violation, which brings a $1,000 fine. The order allows exceptions if a parent or guardian can prove a child has immunity to the disease or can document they should be medically exempt. Despite previous efforts by the city to stem the outbreak, such as community outreach and a previous city order instructing local yeshivas and child care to stop allowing unvaccinated children into their programs, the number of measles cases continued to grow this year. Palacio said this was the first time in recent memory a public health emergency was issued to mandate vaccines. She emphasized that measles is not a disease to dismiss. De Blasio said he is confident the order will withstand any legal challenges. Rockland County’s Orthodox Jewish community has also been at the center of a large measles outbreak. But when county officials tried to bar unvaccinated children and teens from public places through a state of emergency last month, it was quickly knocked down in court. Barbot said since the Brooklyn outbreak was first detected in October, 285 cases of measles have been recorded in the city. Almost all are centered in the Orthodox Jewish community and 246 are children. The outbreak has resulted in 21 people being hospitalized, including five in the intensive care unit. There were just two cases of measles in the city in 2017. People can call the city’s 311 line for a list of places offering low-cost or free vaccinations. De Blasio said the city has been working with community leaders to increase vaccinations. Even though 8,000 additional vaccines were given out in Williamsburg and Borough Park, as compared with the previous year, the outbreak continues. Some people opposed to vaccinations have cited religious beliefs as a reason, while others have said they believe vaccinations cause health problems. One largely held but debunked theory linked vaccinations to autism. “I understand that parents may be afraid of getting their children vaccinated, but the reality is as a pediatrician who has vaccinated hundreds if not thousands of children, I know that getting vaccinated is far safer than getting the measles,” Barbot said. And she pointed out that young children and people with weakened immune systems who cannot be vaccinated are most at risk from people who refuse vaccinations. But the city has promised to do both if residents ignore the order. Barbot said the Health Department has “disease detectives” who will track measles cases to find unvaccinated children and adults. She said they have put ads in Yiddish-language newspapers, sent mailings and made several rounds of robocalls to 30,000 houses to advise people of the outbreak and urge them to get vaccinated. He also dismissed claims that vaccinations go against some beliefs in the Jewish community. But outside the news conference, held at the Brooklyn Public Library’s Williamsburg branch, several women, some pushing strollers, told reporters they believe the city has no right to force them to vaccinate their children. Clarification: An earlier version of the city's order mistakenly listed 11237 as a ZIP code. 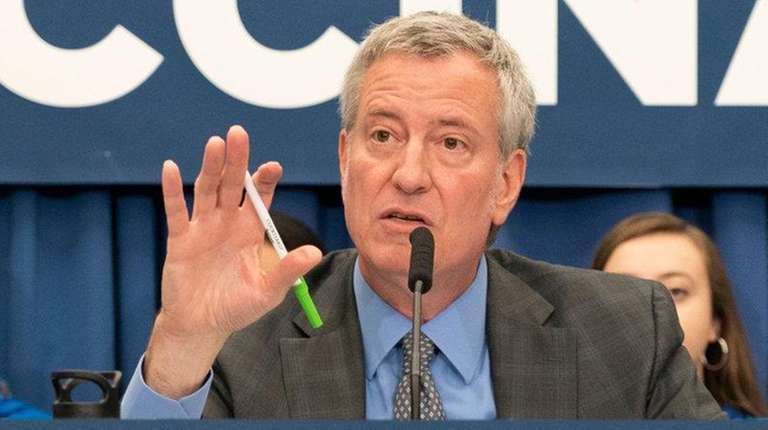 City threatens to close yeshivas admitting unvaccinated kidsOfficials have confirmed 285 cases of the measles since October. Measles outbreak spurs state of emergency in Rockland CountyBeginning Wednesday, anyone under the age of 18 who is not vaccinated against the virus will be banned from public places in the county.